I came across the most wonderful thing over the weekend: a postcarden. Its a post card! No, its a garden! Pop open the vegetable ink-based card, water the base, sprinkle the seed packet and watch it grow. 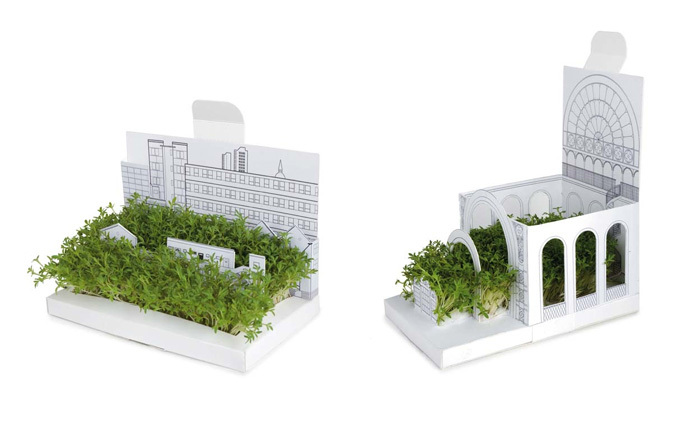 It thrives on sunny desks and window sills–in two to three days time you’ll have unruly sprouts of Lepidium sativum filling the archways. A cityscape and a botanical garden are available for purchase ($12 each) through Uncommon Goods. OH, and don’t forget to buy extra postage–it costs about $1.30 to mail gardens domestically. Wouldn’t this be just the best surprise mail?! P.S. Apologies in advance for my light posting. Our wedding is quickly approaching, and my head is spinning with to-do lists. I will write as much as I can between now and then, scouts honor.